Synthetic peptide corresponding to Human HAUS3 aa 379-408 (internal sequence) conjugated to Keyhole Limpet Haemocyanin (KLH). 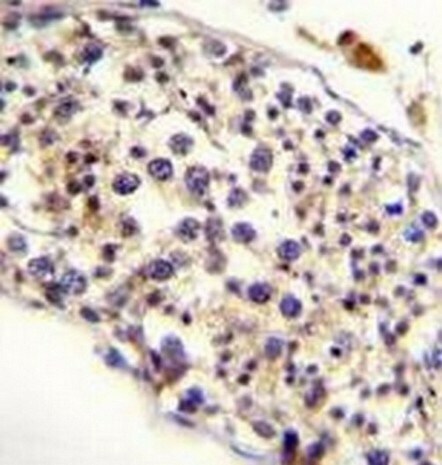 ZR 75 1 cell lysate; Human testis tissue. Our Abpromise guarantee covers the use of ab170808 in the following tested applications. WB 1/100 - 1/500. Predicted molecular weight: 70 kDa. Contributes to mitotic spindle assembly, maintenance of centrosome integrity and completion of cytokinesis as part of the HAUS augmin-like complex. Belongs to the HAUS3 family. Cytoplasm > cytoskeleton > centrosome. Cytoplasm > cytoskeleton > spindle. Localizes to interphase centrosomes and to mitotic spindle microtubules. Immunohistochemical analysis of formalin fixed, paraffin embedded Human testis tissue labeling HAUS3 with ab170808 at 1/10 dilution. ab170808 has not yet been referenced specifically in any publications. Publishing research using ab170808? Please let us know so that we can cite the reference in this datasheet. There are currently no Customer reviews or Questions for ab170808.